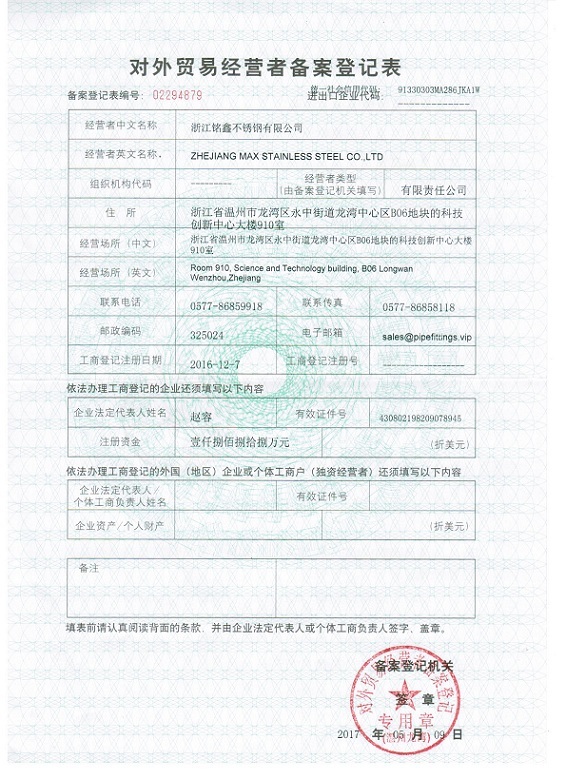 Zhejiang Max Stainless Steel Co., Ltd. is a modern stainless steel pipeline manufacturing enterprise integrating scientific research, production and sales. The company adopts advanced, efficient and mature production management mode. The company selects Walsin Lihwa and Yongxing special steel base metal as Leading materials for the production of high-quality stainless steel, to provide users around the world the most reliable and safest Stainless Steel Pipe and pipe fittings. CNMAX has a number of cold-drawing production lines, as well as a number of cold-rolled units, CNC lathes and machining centers, the main production seamless pipes, bright and annealing tubes, heat exchanger tubes, pipe fittings, flanges and other products. Our motto is quality first, integrity-based and we establish long-term and stable development vision with domestic and international users in various industries. Our company's products are in strict accordance with: GB, ASTM, DIN, BS, JIS, 3A, EN and other standards for production. Materials can provide: austenitic stainless steel, duplex stainless steel, super duplex steel and nickel-based alloy steel and other materials products widely used in automotive, petroleum, chemical, boiler, power, instrumentation, semiconductors, laboratories and other high-end fields. CNMAX has been "quality assurance, professional services, customer satisfaction" for business purposes, pioneering, pragmatic and innovative spirit of enterprise will continue to contribute to the quality of stainless steel products to the community, complement each other and work together to create a better world.